If the supplied PVC sail reinforcements have not been installed yet, do not use them; the pressure-sensitive adhesive will fail in a short time. An improved method that has weathered many hours of heavy winds employs iron-on fabric reinforcements with crimped brass eyelets. If the supplied PVC has already been installed, carefully peel it off (careful around the colored areas). 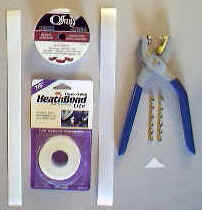 Cut one 12" long piece of 7/8" wide Heat-n-Bond iron-on adhesive (by Therm O Web). Cut one 12" long by 7/8" wide acetate ribbon (by Offray). Following the manufacturer's instructions, iron the tape on to one side of the ribbon (try to keep the backing paper intact on the second side). Measure and cut the tape/ribbon into eleven 7/8" squares, and one 7/8" by 1-1/4" rectangle. The longer piece is used at the top of the jib sail. Cut the twelve pieces diagonally to create 24 triangles. You should now have 24 triangles with adhesive bonded to one side. Following the manufacturer's instructions, remove the paper backing from the adhesive and iron a triangle on one side of each sail where the PVC reinforcements used to be located. Align the long edge of the triangle with the edge of the sail (see drawing below). Orient the triangles at the sail corners for maximum coverage (1-1/4" long piece used at the top of the jib). Be careful not to dwell too long on the sail and reinforcement with the iron to avoid possibly melting the sail, but do dwell long enough to get a complete seal. A little experimentation might be in order. Now, turn the sails over and iron triangles onto the other side directly opposite of the other triangles. Be sure to press hard to assure that complete adhesion. Trim the overhang from the sail corners as necessary. Measure in 1/4" from the sail edges and at the center of the length of the triangles, and make a small "x" with a pencil. This is where the 3/16" eyelets will go. Although which side of the sail the eyelet is installed from does not matter, I chose to have the finished (manufactured) flange of the eyelets on the colored side of the sails. Place an eyelet on the eyelet tool with the small diameter facing up. The tool and eyelet will automatically punch the correct size hole in the sail. Align the eyelet tool center with the pencil marks made earlier and carefully squeeze the tool until the eyelet is fully swaged in place. Be careful not to squeeze so hard that the newly formed flange on the back side punches through the sail to the front side. Rather than running the sail rings through the eyelets of the mainsail to attach to the mast, cut short pieces of rigging string and tie loops through the eyelets. 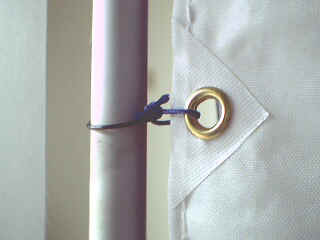 The sail rings are then passed through the rigging string loops. This configuration allows much more freedom of movement around the mast. A pair of small needle-nosed pliers can be used to reform the boom springs as necessary to capture the eyelets. Attachment of the jib is similar; however, if the forestay modification will be performed, attachment of the jib will be delayed until the new forestay configuration is complete.